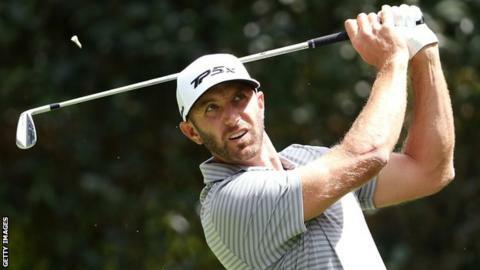 Dustin Johnson shot a four-under-par 67 to lead by two strokes at the halfway stage of the WGC-Mexico Championship. The 34-year-old American, twice a winner of the event, is 11 under par and yet to drop a stroke this week. Rory McIlroy was four shots clear at one stage but shares second overnight after a four-putt double bogey in a 70. Englishman Tommy Fleetwood began his round with consecutive eagles and is four off the lead after a 65, while Tiger Woods is five under after a 66. McIlroy opened with consecutive birdies and also picked up a shot at the fourth, but the sixth hole cost him a shot for the second day running - and four putts from the edge of the ninth green meant he relinquished the lead. "These greens, with a bit of traffic on them, get a little crusty and it's hard to trust your lines, but I'm still in a good position," said the Northern Irishman, who is level with American Matt Kuchar. England's Ian Poulter opened with a double bogey at the 10th but seven birdies helped him to a second successive 68 and a share of sixth. Defending champion Phil Mickelson, who opened with a 79 that left him only one place from the bottom of the leaderboard, birdied the first three holes of his second round and returned a 65 to move up to two over. World number nine Rickie Fowler had a remarkable round, which began at the 10th with a shank out of bounds with his second shot. He then dropped from shoulder height, contravening new laws brought in at the start of the year, and was penalised a shot, resulting in a triple bogey. The 30-year-old had two double bogeys but also made six birdies in a 73 for a two-over halfway total.